Check out the great new Mardi Gras poster by displaced New Orleanian Jamie Hayes. You may be familiar with Jamie’s works…they are used as title pages in the Los Hombres Calientes DVD. 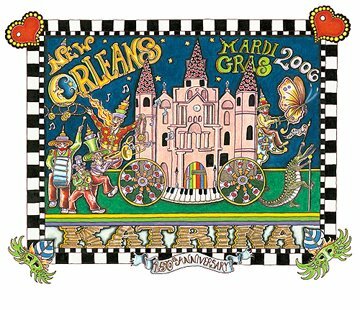 Basin Street Records proudly presents: New Orleans Artist Jamie Hayes and his 2006 Mardi Gras commemorative Mardi Gras poster “KATRINA.” Jamie, who is best known for his whimsical Mardi Gras posters lost both his galleries in the French Quarter and was not even going to make a Mardi Gras poster for 2006. His wife Pam convinced him to create a design, because in 10 or 25 years it would be historically important. He and his family are still displaced and living in California, yearning to come home. Making a purchase of one of Jamie’s true New Orleans style, limited edition prints will help him get a step closer to returning to the Big Easy. We at Basin Street really liked the design, and decided to share it with you, our network of valued customers. We have a special offering for you which includes FREE SHIPPING, and if you buy any two posters on Jamie’s web site, the third poster is free. The “Katrina” poster is 16 X 20 inches, costs $35 and a limited edition of 1000. This poster will fit a standard size frame. Each poster is custom embossed with a BASIN STREET RECORDS LIMITED EDITION stamp, as well as signed and numbered by the artist.